From the summit base lodge, looking south to the frozen Saint Lawrence River. 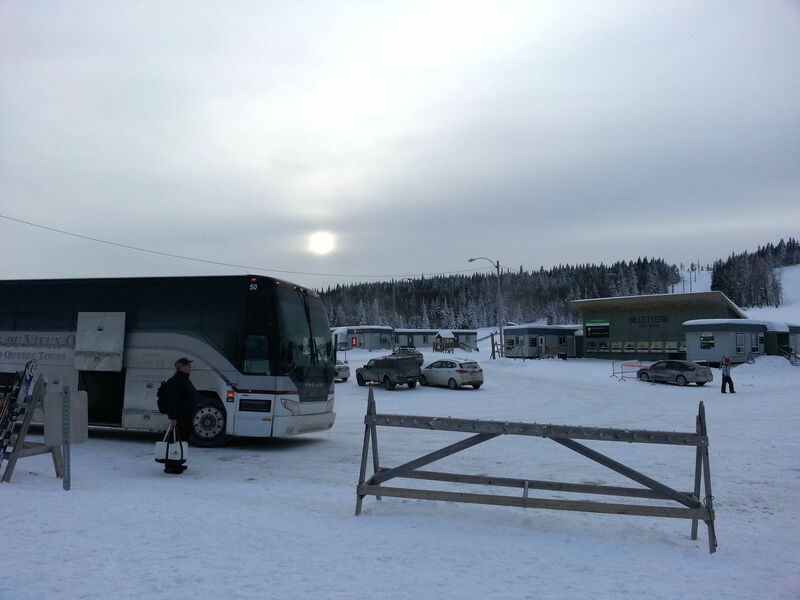 Ski bus picks up day-trippers at le Massif for the ride to Quebec City. You can’t talk about Quebec’s rustic Le Massif mountain resort without understanding how it towers above Charlevoix, a ruggedly beautiful region of fjords, bays and rolling pasture designated a UNESCO World Biosphere Reserve. Mixed in among hearty farmers are artists, artisanal cheesemakers, and die-hard ski and snowboard fans who cherish Le Massif’s views of the Saint Lawrence River despite the harsh winters. During our 2002 visit, we were scolded when we complimented the fair weather.“You don’t live in Charlevoix unless you’ve made peace with the snow,” said locals. Cut to 2015, when our family returned to le Massif, astonished to find things pretty much the same. Except, it was -18º F when we left our Quebec City hotel and 1º F and snowing when we boarded the ski bus back. We enjoyed a wonderful day of skiing largely because Le Massif’s grooming is excellent, the deep frozen base was dusted with a few inches of fresh powder… and we wore three layers of long underwear like the Quebecois. Back in 1970, when locals reached the summit by school bus, le Massif was a liftless, well-kept secret. Today, its 406 acres are still surprisingly undeveloped. Fifty-two trails and glades are served by only one gondola, one quad, and a tow lift and magic carpet for beginners. While it’s the tallest mountain (a 770m or 2,526-foot vertical drop) with the most annual snowfall (659 cm/22 feet) east of the Canadian Rockies, neighboring Mont-Sainte-Anne and far off Mont-Tremblant feel larger because of their commercial development. Snow guns cover about 76% of trails in case Mother Nature does not cooperate, ensuring a good day throughout the December to April season. Le Massif has a split personality: a double-black-diamond western face whose slopes have trained the Canadian female Olympic team, and a gentle eastern side. It’s also unusual because the base village is at the summit, which means you don’t need a lift ticket till you’ve skied all the way down. Even children on the bunny slopes will be able to enjoy the pristine vistas of the river below. Today, visitors can still ski or ride like their grandparents did, surrounded by trees with nary a condo in sight. But things may soon change. Daniel Gaulthier, co-founder of Cirque du Soleil, now owns the mountain. In efforts to kickstart the local economy, his Le Massif de Charlevoix company has invested in the mountain resort, the stylish Hotel la Ferme in nearby Baie-Saint-Paul; and both a rail line from Quebec and a light rail from the coast to get there. On mountain, there are comforts like a base lodge with free lockers, and a peak café with hot chocolate and food on weekends. The cafeteria serves French onion soup, pate, and locally sourced cheese and fruits -– no fried foods allowed. There is a top caliber Rossignol demo and equipment rental shop, which dispenses kids gear and helmets very efficiently. Expanded programs include outdoor sledding on a luge run, ice skating, backcountry tours and activities to enhance the mountain’s summer appeal. Coming in 2020, a new base village with a condo real estate development will use the current light rail to connect to the coastal town of Baie-Saint-Paul. Several people spoke of a pending deal with Club Med to build a 300-key all-inclusive resort at the base as well. Time will tell; what we have now is a quiet family resort that is environmentally pristine and very good value compared to its New England neighbors. Next to the base lodge are the ski and riding schools, and the daycare center. The garderie daycare is a bright area with big picture windows so toddlers can watch skiers, and parents can check on their offspring. Inside, children 2-10 years of age are tended by women trained in 1st Aid and early childhood education. It’s open 9am to 4pm Saturday and Sunday, and daily during holidays, by the hour (CAD$15) or day (CAD$45). For only CAD$95, your toddler can spend the day in the program and take a 1-hour private lesson. Le Massif, with 85% intermediate or tougher terrain, usually attracts better skiers and freestyle boarders, but families will find the novice area – open Thursday through Sunday and daily during school holidays — a very picturesque place to learn. The ski school offers daily group lessons for beginners; ages 2-6 take one-hour classes and older kids and adults have three-part lessons to master skiing, snowboarding or telemark. Visitors ages 3-15 can sign up for three to five day Holiday Camps run during the school holidays. Advance reservations required. La Fondation des skieurs handicapés du Québec (FSHQ) works with le Massif to provide adaptive ski lessons to the mobility impaired. They train tandem pilots and specialized instructors on an assortment of custom equipment; call 418/632-5876 for reservations and information. Totally free of charge, Massif Mountain Guides provide free tours — a great introduction to the heavily wooded mountain for any family. At our recent visit, we skied for a few hours with Villenay, whose deep knowledge of the trails (“The left side is more icy today…”) and friendly manner pushed us onto runs we’d never have tried. Here’s a video from our day, by Ron Bozman. Great fun for all ages is rodeling done on the new Luge Hill, a 7.5 km-long run designed to accommodate one-person wooden sleds. Called luges by the locals, they reminded us of Citizen Kane’s famous “Rosebud.” Sleds steered by body weight and slowed by dragging feet are rented for a two-hour experience that includes instruction, guidance, and a leisurely descent through a wooded area offering full views of the frozen river. A hugely popular attraction, it lures many families who want to trade in a day of skiing for other adventures. Rodeling sessions cost CAD$35.95/ages 10-17 and CAD$39.95/ adults and includes a Snowcat tour uphill; advance reservations required. If the kids are captivated by the luge, go for sledding all the way at the mega-tubing hill, Village Vacances Valcartier, about a half hour away. But quiet is also a fun region to explore. The smaller hills are punctuated by family businesses, working farms, art galleries, small gites and several crafts workshops. The region’s noted economusees, such as the Laiterie Charlevoix Cheese Factory producing wheels of cheddar and Fleurmier (soft cheese with a flowery crust), welcome visitors and provide an interesting factory-tour style outing on non-ski days. Families interested in cross-country skiing, hiking or snowshoeing have a vast network of trails at Petite-Riviere-Saint-Francois, accessible by light rail if you don’t have your own car. This tiny town dates to 1675, and its small chapels with their historic murals and traditional architecture make it a popular Quebecois stop. The most popular trails are Sentier des Caps, Le Forestier and La Promenade at the le Massif base. The closest lodgings are B&Bs in the riverfront town of Petite-Riviere-Saint-Francois, but there’s more action, galleries, a Museum of Contemporary Art, fine dining and shops in Baie-Saint-Paul. For information on gites (B&Bs), auberges (inns) and dining, research the Tourist Office of Charlevoix and the Municipality of Petite-Riviere-Saint-Francois sites. Baie-Saint-Paul is the site of Hôtel La Ferme. Designed as a barn-like complex, this contemporary hotel / social hub has 145 spacious rooms and lofts fanned out across five pavilions. It’s very family oriented, with kids’ workshops, supervised camps during school holidays, and large Family Rooms furnished with bunk beds and fun rainfall showers. Skiers and snowboarders can exit the lobby dressed for the slopes, pick up their skis and snowboards from heated lockers, and board the light rail train directly to Le Transit, a small gondola that brings train travelers to the main mountain gondola. 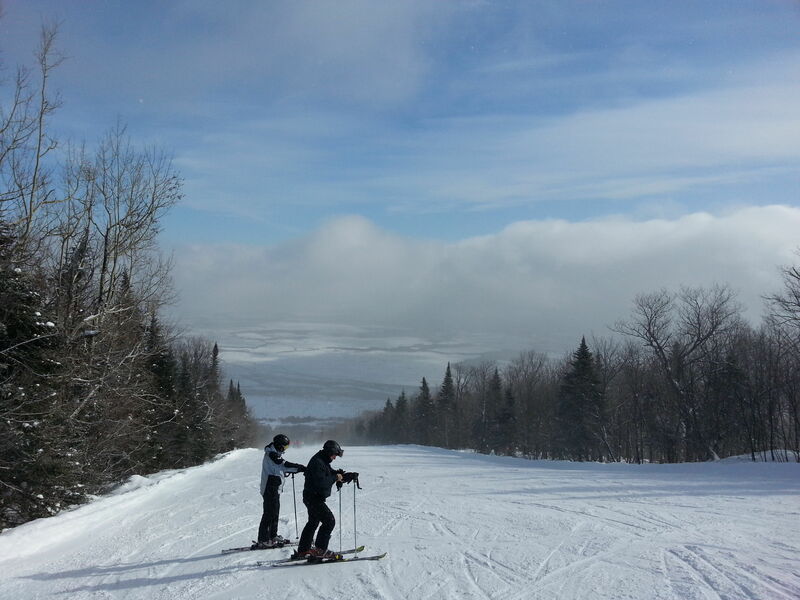 Skiers have more trail options through the Summits of the Saint Lawrence, a regional lift ticket that can be used here; at Mont-Sainte-Anne, the region’s better known resort only 33 kms/20 mi to the west of le Massif; and the smaller Stoneham which has a big night skiing social scene. Staff and most guests are bilingual, but you can use our French Snow Talk cheat sheet or slow down and really practice your foreign language skills. Quebec City is the nearest international airport, and this beautiful city is so close to the mountain that it could be your base. Tours of Old Quebec runs daily trips to Le Massif or Mont-Sainte-Anne from the city; the 8-hour excursions cost CAD $91.80 for four if you buy a Family Ticket. Unfortunately, The Train only runs in spring and summer, making sightseeing excursions from Quebec City with stops at Baie-Saint-Paul and la Malbaie, serving fine meals along the way.